Hot this week: Cuno causes a bit of a stir in some circles by not really saying anything new. …which surprises no one. When one finds oneself falling back on ideas of “Western civilization” and ideas of Western exceptionalism to defend one’s stance…one should probably be tucked into bed for the night. A response to the recent Cuno stuff from Kwame Opoku. And rumors are flying about who is responsible. The Indian idol scandal, maybe another one, PLUS a brewing issue with an Indonesian piece. For more info about Huaca Malena, check out my Trafficking Culture encyclopedia entry…which has short passages that are surprisingly similar to this BBC article…*cough cough*; okay, situation solved all! Thanks BBC. Among other things the thieves stole statues and a manger set worth a lot of money. Now AIA central has condemned the St Louis chapter sell-off of archaeologically excavated antiquities from public to private hands. …now that they are a ‘looting-weary buyer’. Very interesting. A collector in Texas brought arrowheads to the college for authentication. The college says he looted them and wont return them. I wouldn’t have thought that they would, but yes. Worth reading if you are following the case. After going missing from Prince of Wales Island, the totem pole ended up in the possession of John Barrymore and Vincent Price. Now it is back in Alaska. The Kakwaka’wakw pieces are contemporary but are heritage none the less. Police feared they would be sold to a gallery or collector. That was quick! The police made an arrest. This following 10 years of negotiation and research. Everyone should read this one. It is exactly what is wrong. Six armed robbers broke into a temple in Takchi village, stole 18 idols and smashed 6 more. Villagers tried to stop them but their lives were threatened. Because the village is remote, it took authorities 3 days to get there after the robbery. 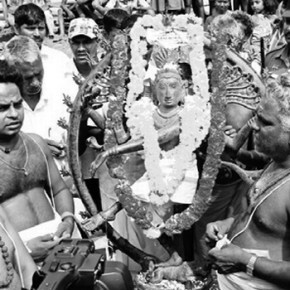 Lovely images of the stolen idol returning to Sri Puranthan village in Tamil Nadu. This is the situation the world over: remote churches (or temples, etc) are filled with objects of devotion but financial and logistical issues make them nearly impossible to protect. If you remove the items from the church, very poor people lose their living heritage. Well this is a low for the cultural property thieves of the world. Not the first time a Work Will Set You Free sign has been stolen. More on WWII art restitution and return. Helped to steal a monstrance from the Catharijn convent museum in Utrecht. Is the idea of ‘inalienable’ French cultural patrimony over? This band, based out of Ireland, is accused of robbing museums and auction houses of historic rhino horn which they sold on the black market. Medal theft is a thing. Skirting the edge here, but I think absurd copyright law is a crime against art and expression so in it goes! These were the people accused of taking Chinese artefacts from a number of museums. Not your average museum theft when a tank goes missing from a museum in Armenia in 1990.